The Professional Regulation Commission (PRC) already announced the results of September 2015 LET (Licensure examination for Teachers) also known as teachers board exam. PRC and its regional offices now inform 21,461 elementary teachers and 34,010 secondary teachers (LET Passers) for their schedule and venue of registration, oathtaking schedule as well as verification of ratings page. View the complete results of September 2015 LET here. PRC announced on November 30 that registration for the issuance of Professional Identification Card (ID) and Certificate of Registration which will start on Monday, December 7, 2015. However, PRC on Thursday though Memorandum dated December 2 postponed the registration of September 2015 LET passers. 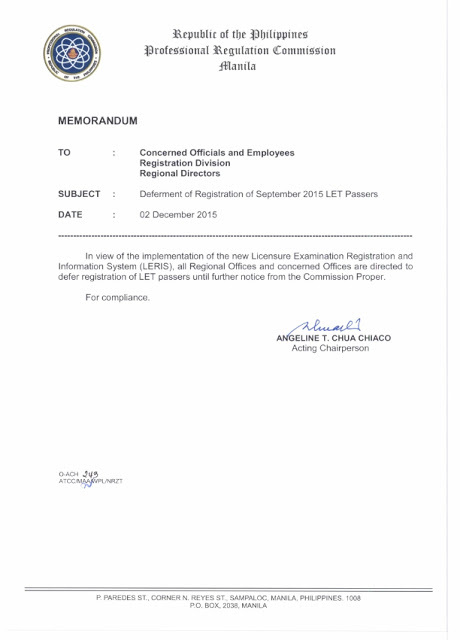 This is in view of the implementation of the new Licensure examination registration and Information System (LERIS). The commission instructed all concerned offices to defer registration of LET passers until further notice from the commission. December 4, 2015 Update: PRC announced schedule of registration for Manila passers of the September 2015 Licensure Exam for Professional Teachers. Venue is at the PRC Ground Floor, Main Building. December 7, 2015 Update: PRC released updated schedule of registration for September 2015 LET Manila passers. December 15, 2015 Update: Schedule of registration for Cebu LET passers announced. PRC Davao - schedule of their initial registration at the PRC Davao Regional office. NOTE: REGISTRATION FOR NON-DAVAO EXAMINEES WILL START ON DECEMBER 21, 2015 AT FIVE (5) REGISTRANTS PER DAY. ALL REGISTRANTS MUST SECURE A PRIORITY NUMBER FIRST AT DOOR 9, GROUND FLOOR. o Payment of Initial Registration Fee of P1,050.00. PRC advised that successful examinees should PERSONALLY register and sign in the Roster of Registered Professionals, PRC said. As the results were announced on Monday, PRC said that the dates and venues for the oathtaking ceremonies of the new successful examinees in the said examination WILL BE ANNOUNCED LATER. Meanwhile, PRC Board News consolidates all the announcement made by PRC regarding oathtaking schedule and will be updated here once available. PLEASE COME IN FORMAL ATTIRE. CHILDREN BELOW SEVEN (7) YEARS OLD ARE NOT ALLOWED. Please buy your tickets during the scheduled mobile processing or at the Baguio Regional Office. 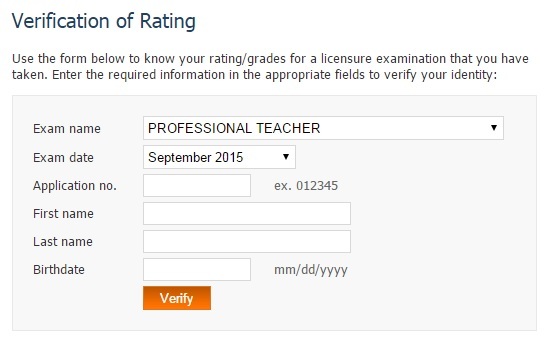 PRC online verification of ratings (VoR) page for September 2015 Licensure examination for teachers (LET) is now available. Go to the official website of PRC. Click Services tab and in the right side you will see Verification of Rating under Our Services menu. Other option is to follow this link for easy access. Once you've access the Verification of Rating (VoR) portion, you will see blank fields like as you see on above photo. Select the Exam Name (Professional Teacher) and Exam Date (September 2015). Input your application no., first name, last name and birthdate. VERY IMPORTANT: If you have 'Jr" name suffix , please add it after your FIRST NAME (i.e Eduardo Jr ) to avoid 'no matching record found' error. If you find this informative, we encourage you to bookmark this page or Share Now this article on social networks (Facebook and Twitter). Follow us also via RSS Feeds to receive exam-related news.